Ronnie Lott is considered by many fans and analysts of the game to be the greatest defensive back in NFL history. That reputation carries over to Ronnie Lott cards and autographed memorabilia. His on-field accomplishments include being a ten-time Pro Bowl selection and four Super Bowls. 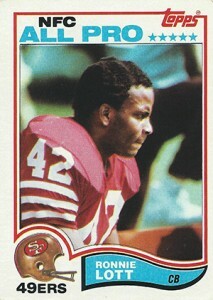 Lott's rookie card is from the 1982 Topps Football set. Besides his player card, Lott is also featured on an In Action subset card. Other early cards include two 1982 team-issued cards. His first certified autograph card is part of 1991 Pro Line Portraits. The card is not serial numbered and an exact print run has never been disclosed. 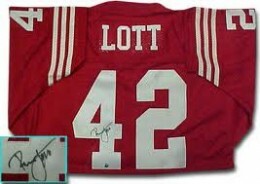 Lott's first game-used memorabilia cards were issued in 2000 by multiple manufactures. A 2000 Playoff Momentum autographed jersey card is highly coveted by collectors. It is serial numbered to just 25 copies. 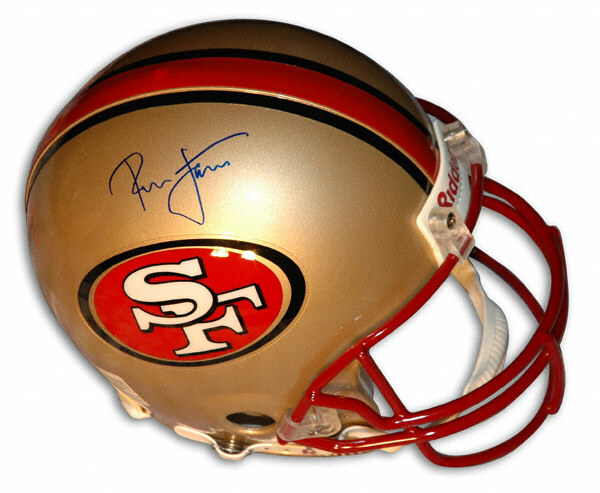 Ronnie Lott's autographed memorabilia has maintained its value through the years. Autographed footballs and jerseys are commonly found items. He does participate in organized signing events and is said to deliver a fan-friendly, in-person signing experience. This set marked the first year since 1969 that Topps was able to use NFL Licensed team logos on its trading cards. The design is very similar to that of the previous year. Lott's card is considered to be the key rookie card in the set along with Lawrence Taylor and Cris Collinsworth. RONNIE LOTT 1999 UPPER DECK CENTURY LEGENDS DIECUT PARALLEL #61 100 -49'ERS!!! 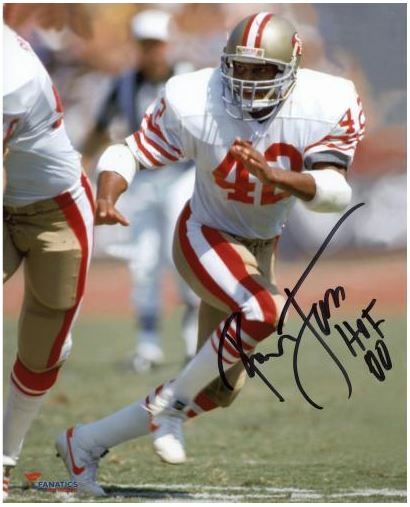 Below you will find examples of what an authentic Ronnie Lott autograph looks like. This can be used as a first point of reference for determining the legitimacy of autograph memorabilia, but is not a substitute for having your items authenticated by a well-respected professional autograph authentication company. Some of the trusted sources within the sports memorabilia market include the following companies: PSA, JSA, Steiner, Tristar and Mounted Memories. Click on any of the images below to view full size photos. Other than the letter "R," the remaining letters are hard to discern. The "R" resembles a crookedly written numeral "2" with a vertical line running through it. The "L" is very unique in that it looks like a combination of an uppercase "J" and a lowercase "t."
49ers Hall of Famer RONNIE LOTT Signed Mini Helmet AUTO w HOF '00 - JSA! !